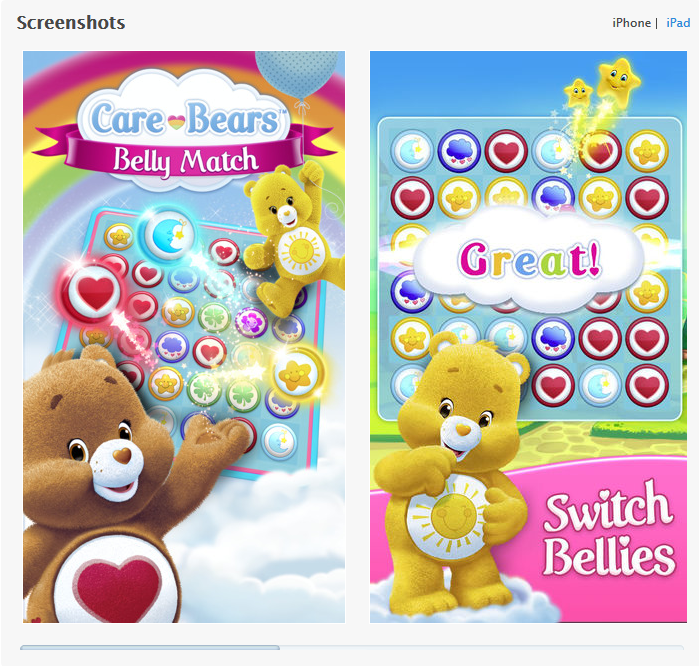 Care BearsTM: Belly Match takes you to the beautiful world of Care-a-lot and lets you be a Hero. In this fun and exciting game, Grumpy and all the other Care Bears need your help to make their world a HAPPY place again. Let’s switch and match Belly Badges through hundreds of levels in this dreamy and magical world! – SWITCH, SWAP AND MATCH COLORFUL BELLY BADGES to unlock multiple levels. -ENJOY CHEERFUL BOOSTERS such as Share Bear’s Scooter, Cheer Bear’s Pom-Pom & many more. -DEFEAT the mischievous King Beastly by beating him at his own game! – RACE against the CLOCK in this rocking BEAR-BLITZ MODE: DASH as many Belly Badges as possible before time runs out! – EXPRESS YOUR LOVE: Gift your friends a Care Package or even extra lives! – EXPLORE HUNDREDS OF ENCHANTING ISLANDS while you gather the rainbow sparrows or unwrap Share Bear’s delicious lollipops. -This game is free to download and play. However, special game items can be purchased for a fee. You can also disable in-app purchases in your device’s settings. MotoHeroz’s new Rival update introduces intense Player versus Player challenges, letting you take on your Facebook friends directly – or challenge anyone in the world! Rival Mode is a new gameplay mode that brings intense head-to-head matches to the wild world of MotoHeroz. To start a race, simply choose any of your Facebook friends who play MotoHeroz, or let the game choose a random opponent for you from the millions in the world. You’ll then have one opportunity to make the best time possible on a randomly chosen track. Then your friend receives the challenge and must try and beat your score in one go. If your friend is too slow to respond, give him a poke to get him going! After both of you have raced, watch a replay showing both buggies in action, to see exactly how you triumphed – or where it all went horribly wrong! – Facebook Integration – Challenge your Facebook Friends … or a random MotoHeroz player! – New Replay System – Watch the results of your one-on-one challenge! – BONUS: MotoHeroz is now Free-to-play! INTRODUCING AN ALL NEW MODE FOR MOTOHEROZ FANS – ONE SHOT! Think you got what it takes to top the charts in MotoHeroz? Then Prove your worth in new daily One Shot challenges! ✓ The more players participate, the bigger the pot grows! ✓ New and improved Dynamic Shop! ✓ Max out your motor in the improved MotoHeroz shop!